For this summer reading assignment, you will be tasked with choosing an essay prompt to respond to, completing an outline or graphic organizer for your essay, writing a first draft, revising your first draft by using a self-editing checklist, and writing a final draft. When choosing a prompt, be sure to read the prompt carefully. 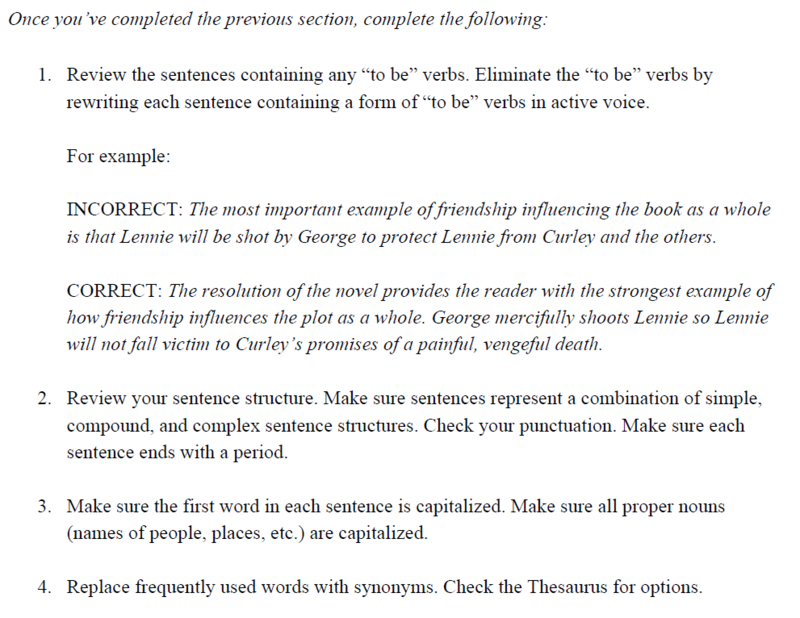 Be sure to address all parts of the prompt in your essay. You must submit ALL components on the due date in order to receive full credit for your assignment. There are several components to this assignment. You will complete an outline or graphic organizer, write a first draft, use the self-editing revision instructions to revise your first draft (using the checklist to keep track), and then write a final draft. 1. Works of literature often feature characters that question the values of the societies in which they live. From the book you read this summer, select a character who questions the values of the society in which he or she lives. In a well-developed multi-paragraph essay, identify the character, describe what the character questions about society, and explain why the character’s questioning is important to the meaning of the work of literature. 2. In many works of literature, a character goes on a journey that changes his or her life. From the book you read this summer, select a character who goes on a journey that changes his or her life. In a well-developed multi-paragraph essay, identify the character, describe how the journey changes the character’s life, and explain how the journey relates to the work as a whole. 3. Often in works of literature, the subject or character has a mixture of positive and negative traits. From the book you read for the summer reading assignment, select a subject or character who blends positive and negative traits. In a well-developed multi-paragraph essay, identify the character, describe how the character demonstrates both positive and negative traits, and explain how the character’s traits are important to the work of literature. 4. Honor can have different meanings for different people. Literature is full of characters who can be considered honorable. From the book you read this summer, select a character who is honorable. In a well-developed multi- paragraph essay, identify the character, describe what makes the character honorable, and explain why the character’s honor is important to the work of literature. Be sure that you are directly addressing the prompt and its components. Do not just summarize the plot of your book, or you will not receive credit for your assignment. Complete an outline or graphic organizer for your chosen prompt. Click the button below to open a new window and view a sample blank outline. Graphic organizers are located under the "Additional Resources" menu item at the top of this page. Includes at least one direct quote from your novel, properly cited in MLA format, per body paragraph. Example from Tim O’Brien’s The Things They Carried : “It struck me then that he must have planned it. I’ll never be certain, of course, but I think he meant to bring me up against the realities, to guide me to the river and to take me to the edge and to stand a kind of vigil as I chose a life for myself.” (O’Brien 53). When your first draft is complete and it meets the basic requirements above, complete the self-editing revision tasks below. 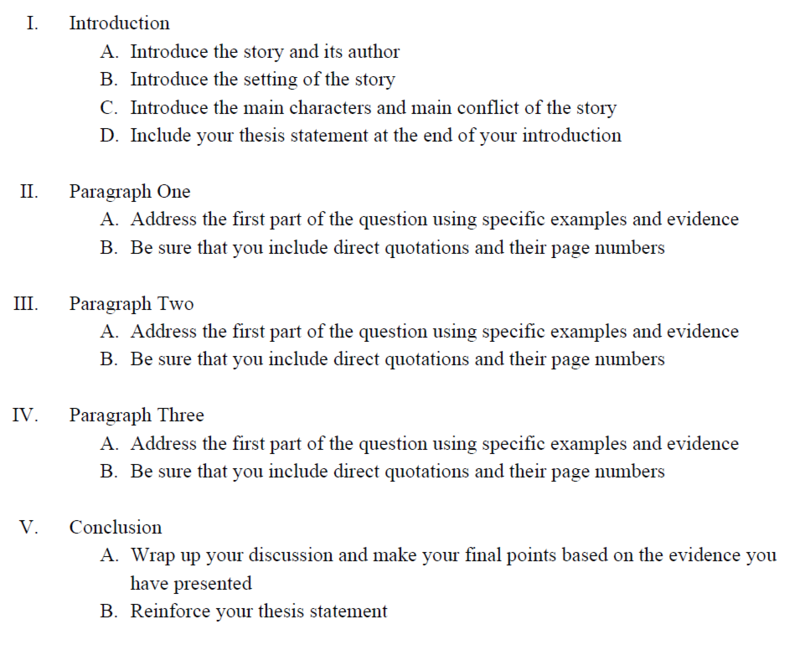 You will need to print a copy of your essay to complete these revisions. Click the button below to download a copy of a checklist that you can use to keep track of your revisions. Using your first draft and the revisions you made in the last section, write your final draft. Make sure your final draft is free of any grammatical or spelling errors, and is formatted properly!